Incredible heart shaped green leaves that turn shades of yellow, purple and red in autumn. Foliage releases a sweet toffee apple fragrance when it drops in late autumn. Supplied as established plants in 9cm pots. Will grow to about 5m (15ft) in 10 years. For the best displays, plant in acidic soil in a sunny spot. There are few sights and smells more arresting in the garden than a Katsura or 'Toffee Apple' Tree in mid autumn. Its heart-shaped green leaves turn shades of yellow, purple and red before falling to the ground and releasing a distinctive and intoxicating fragrance thats similar to fairground candy floss or sweet toffee apple, hence it's name, Heavenly! Peter experienced this last Autumn while walking in a lovely parkland setting, where the scent truly filled the air, as the Autumn colours were at their very best and richest, and now he is a big fan too! Growing to around 5m in a decade, this tree can eventually reach 15m and will do well in a really sunny spot or light shade. 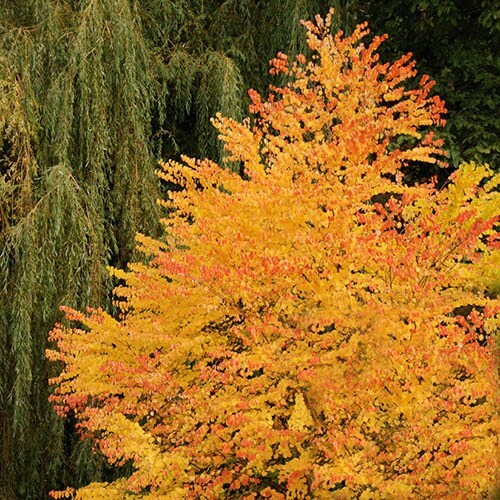 For a breathtaking display of autumn colour, plant in moist, well drained soils, and making a perfect speciment tree, plant Katrusa trees for years of pelasure. Supplied as a pair of established plants in 9cm pots, at 20-25cm tall (dormant in Winter).